Clarinettist Eichenberger and double bassist Studer have been operating in tandem for over eight years after having attended more populated assemblies since the late 90s. 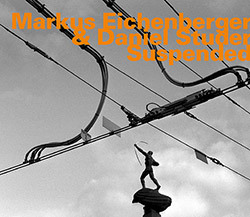 Suspended is an affidavit of the solidity of their joint sharpness, an album consisting of seven improvisations defined by sometimes strange titles ("Walking Harshly", "Glancing Loudly") yet distinguished by the qualities that separate the practitioners of serious acoustic craft from the self-publicists who categorize the act of drooling into a tube or swatting flies off a string instrument as "art". The aforementioned qualities can be encapsulated in two words: concreteness and reactivity. In the implicit poetics of such dexterous instrumentalists, even utter quietness emanates credibility, rather than being an excuse for relishing the outside traffic without caring about the music. Eichenberger and Studer's pictures are pigmented by resonant upper partials, educated noise, meaningful atonality, total control on pitch emission. The sounds encompassed by these performances enable a listener to choose between the focused dissection of certain intrinsic components and the relaxed acknowledgement of contrapuntal spurts that leave considerable breathing room in spite of the occasional sting and/or sudden dynamic surge. The timbral coupling of reeds and arco-ed strings is one of the most gratifying. It would be easy for expert players to allure an audience into the molasses of brain-dead stylishness. On the contrary, Eichenberger and Studer intend every gesture � from surgically firm to next-to-angry � as if they wished to show us that a musician's humanity must necessarily result from the correspondence of accuracy and intuitiveness. Inside the interaction � even when it's just whispered � there is always something that sings.